Facilities: FCI Otisville with an adjacent minimum security satellite prison camp, and a detention center. Location: FCI Otisville is located in the southeastern part of New York, near the Pennsylvania and New Jersey borders; 70 miles northwest of New York City (NYC). Background: FCI Otisville was opened in 1980 and is based upon an open campus-style layout. Notable inmates include Shalom Weiss (convicted in 2004 for fraud, racketeering, and money laundering), Sholom Rubashkin (serving 27 years for fraud), and former financial adviser Kenneth Ira Starr (serving a 7 year sentence for fraud and money laundering). Housing: Inmates are housed in two-person cells. Inmates in the camp are housed in cubes and dormitories. 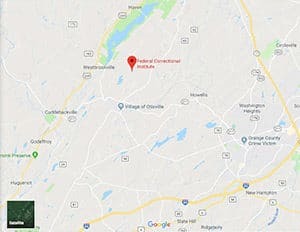 Health Services: Routine health care, physical examinations, emergency care, medications, eyeglasses, and dental services are available to inmates at FCI Otisville. All inmates at the camp who wish to be seen for sick call must report to the common area during designated hours. In emergency situations, inmates must let the unit officer, unit team, or any other staff know, who will then contact Health Services. Psychology Services: FCI Otisville psychology services include intake screening for designated inmates, evaluations requested by staff or the court, group and/or individual treatment, and crisis intervention. Some individuals may be evaluated as a result of court orders, parole commission requests, or Unit Team referrals. Psychology Services also conducts halfway house interviews. In the camp, psychologists are available for individual and group psychotherapy. Inmates interested in services may submit an Inmate Request to Staff Member to Psychology Services. Mental health services are offered in areas of behavioral and emotional problems. Residential Drug Abuse Program (RDAP): FCI Otisville and the camp do not house a Residential Drug Abuse Program (RDAP), but referrals can be made to institutions which do provide RDAP. A Drug Education Program, the Non-Residential Treatment Program (NR-DAP), Alcoholics Anonymous (AA) and Narcotics Anonymous (NA) are also available. Education Services: FCI Otisville provides literacy, GED, and English-as-a-Second Language (ESL) programs. Parenting and Adult Continuing Education (ACE) classes are also available. High school diplomas and post-secondary programs are available through paid correspondence programs. Advanced Occupational Education: FCI Otisville offers advanced occupational education in Computer Skills, Floor Care Maintenance, Custodial Technician, Horticulture/Landscape, Textiles, and Production. Vocational Training: FCI Otisville and the camp do not offer any vocational training programs. Apprenticeship: FCI Otisville and the camp do not offer any apprenticeship programs. Library Services: FCI Otisville offers both a leisure and law library. The leisure library contains reference materials, encyclopedias in English and Spanish, newspapers, videotapes, and periodicals. The law library provides access to legal materials and an opportunity to prepare legal documents through the use of the TRULINCS Electronic Law Library. A copying machine is available to reproduce materials needed for research. Electric typewriters are also available for inmate use. UNICOR: The FCI Otisville UNICOR facility produces electronics and plastics. The camp does not house a UNICOR facility. Commissary: A spending limitation of $360.00 per month is available for inmates. Items exempt from the monthly limit are postage stamps, copy cards, over-the-counter medications, and TRUFONE credits. Commissary purchases can be made one time per week in accordance with the scheduled shopping days. A wide variety of items are available for inmate purchase. Recreation Services: Recreation and leisure activities at FCI Otisville include a variety of options. Weights, cardio equipment, bocce ball, horseshoes, basketball court, handball court, tennis area, baseball field, running, and walking are all available. All recreation programs are posted on the Unit Bulletin Boards. Times and special events are also posted throughout the units and in the recreation/leisure times areas.